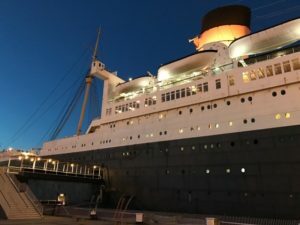 Day 1…The InnSpire Summit & Marketplace, The Queen Mary, Long Beach CA. Ran into and old friend and colleague. 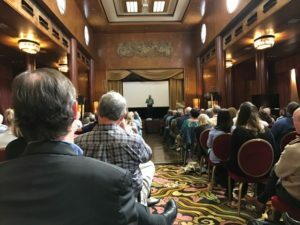 Started chatting about innkeeping conferences, current and past. He told me about a comment from an innkeeper that he would never forget. He asked this innkeeper, what is the value you get from attending an innkeeping conference? Here is a sample of some of the sessions offered, the landscape. There are different paths or categories to choose from. 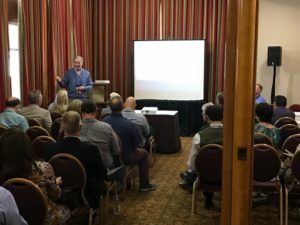 One of the first sessions was for the newbies, ‘Benchmarks for the New Innkeeper: How do I Measure my First Year in Business?‘ The room was packed with new and seasoned innkeepers. Peter Scherman, and innkeeper Don Lynch presented some tools and stats to help you gauge your business success. Ways to work ‘on your business’, not just ‘in your business’. Big difference. The ‘Guest Experience Path’ offered, ‘The Dynamics of Creating Consistency’. A panel of seasoned innkeepers talked about their approach to brand consistency at their inns. How they deliver on the promise their marketing presents. Their experiences triggered lively audience participation with questions and more great examples. You could see light bulbs go off. Heads on Beds Path. ‘How Airbnb and Professional Bed and Breakfast Can Collaborate and Win Together.’ Now you can imagine how packed this session was! Led by Chip Conley, Head of Global Hospitality and Strategy, Airbnb. How the future of a collaboration between B&Bs and Airbnb is one that can benefit both. The presentation and discussion, among many, involved the plan for Airbnb to launch a ‘Professional Designation’ category on their website. This has been promised in the past and is still in the working stages. Lunch was served in the Marketplace for attendees and Allied Partners. Time to shop and network with variety of old friends and new. 58 booths in total. From Amenities to Website Design. The buzz and enthusiasm in the hall is invigorating. After we all refueled, back to education. How about some help with Social Media? ‘Mastering Social Media Advertising’. Alex Cameron, founder and CEO, Signature Marketing Consulting offered great ‘how to’ advise on Facebook Ads. Step by step tools, simply presented and applicable for our business. Late afternoon sessions. Time to grab some coffee at Starbucks. The landscape is broadening. Back of the House Path offering, ‘The State of the Marketplace: Are Inns Selling? Are Banks Lending? Are There Buyers and What Are They Looking For? Rick and Peter are finishing this session as I am writing. I hope they left time for plenty of questions. There was a total of 23 sessions today. Most innkeeper couples and/or staff divide and conquer the battlefield then gather to plan their next attack. Day 1 coming to an end. See you tomorrow. This entry was posted on Tuesday, January 31st, 2017 at 5:15 pm	and is filed under Innkeeping Business, Innkeeping Events. You can follow any responses to this entry through the RSS 2.0 feed. Both comments and pings are currently closed.